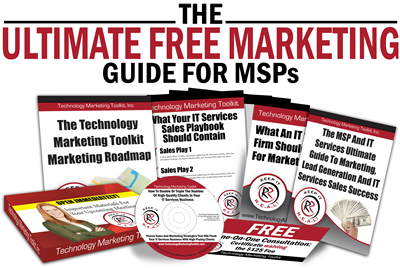 MSP Triples Their Bottom Line In One Year! There is an old saying: “You never just marry the person. You marry the mother, father, siblings …” What I did not realize is that, along with Eric, I married his fledgling business, PC Troubleshooters too. The “three” of us have lived in wedded bliss – well, sort of – for nearly two decades! But after slow, consistent growth for years, it came to a screeching halt. We were stagnant… until we found Technology Marketing Toolkit and changed our mindset. A Marketer And A Tech – A Match Made In Heaven? Lisa’s story: Marketing and branding are in my blood. My grandmother sold ladies’ skin-care and cosmetics. My grandfather sold men’s suits. While making the sale, he would talk about the skin-care products his wife sold (a great joint venture deal!). My first job post-college was selling books at Houghton Mifflin in Boston. I got the job with that publisher because I told my prospective employer, “I want to work trade shows!” I was hired, and off to trade shows I went! Eric’s Story: Eric has been immersed in computers from a young age. From taking apart and putting back together the family vacuum to playing with his brand-new Commodore VIC-20 computer as a young child, he spent days and nights buried in technology. To put himself through college, Eric started a tech-support business. He began by helping create spreadsheets for a professor’s card game, and in just a short time landed his first true business client – a small law firm. Fresh out of college, he took a job in IT support at American Power Conversion (APC) to pay the bills. For three years, he worked double shifts, building PC Troubleshooters during the day and on weekends, while working second shift at APC, supporting 300 laptop users in the sales department. 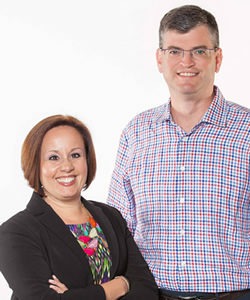 One day, Eric was approached by that same friend, who said, “I think you should meet this girl …” Two years later, the THREE of us were married … me, Eric and PC Troubleshooters! PC Troubleshooters was all-consuming in our lives. While still working full-time in sales for Houghton Mifflin, I started to do projects for “our” business, building PC Troubleshooters’ young brand. Our first major success was a full-page write-up in Providence Business News, the premier business newspaper in our state. We then added a website, a brochure and our first uniforms but needed more to sustain long-term, consistent, predictable growth. Like many other tech-focused business owners, Eric didn’t invest in, nor understand, the importance of consistent marketing to grow our business. He just didn’t have the “time” or the “resources” and viewed it as an expense, not an investment. He had equipment to buy, Microsoft training to schedule and, of course, clients to service. You could say this mindset created a bit of static in our marriage. After 15 years in business and growing into a nearly $2 million per year company, we hit a ceiling. New business kept passing us by and longtime clients started to leave, thanks to our lack of processes and unpolished soft skills. Corporate Identity – PC Troubleshooters said old-school, mom-and-pop shop. We rebranded and changed our corporate name, tagline, logo and website. We were now Secure Future Tech Solutions. Polishing our Tech Team – We asked, “How do you want to be perceived by others?” We focused on grooming, speaking skills and new uniforms. Enhanced Phone Skills – Not only did I provide new scripts to use, but I also focused on how each person sounds, using tone, volume, inflection, etc. Nonverbal Behavior – We looked at how behaviors such as rolling your eyes and slouching have an impact on perception and ultimately can lose a fellow employee’s, client’s or prospect’s trust. Grammar – We looked at how an e-mail or invoice description can be easily misunderstood. We also talked about documenting for fellow engineers to understand if they need to cover for you. As one must do in both business and marriage, we learned from our mistakes and forged ahead. Microsoft And Big Red – We Were FINALLY Marketing! November 12, 2015, was a pivotal changing point for our business. Eric and I received an exclusive invitation from Microsoft SMB Champions to participate in a new pilot program put on by both Microsoft and Robin Robins. Before I could hit the delete button, Eric approached me and said, “I want to do this!” He finally wanted to invest in marketing and I was thrilled! In the first three months of using Robin’s program, we generated over $37,000 in new revenue, honorable mention in Microsoft’s marketing contest and made the jump to Robin’s Producers Club Master Mind group. Robin pushed us to focus on our target market, and to track, measure and analyze ALL our efforts! This was a painful lesson for us. If it was not in QuickBooks or Autotask, we didn’t track it. We started creating spreadsheets for leads, and tracking where leads came from. What a revelation! The constant kick in the pants from “Big Red” even made us look at other areas of our business. We started with engineer utilization. Our reports reflected abysmal utilization percentages. We turned this around by setting an individual and team SMART goal of 75% every week. We showed the numbers (and still do) every Friday during our staff meeting. After shooting out of the gate with 24.1% services growth those first 11 months with Robin, we were sold on the value of marketing and weren’t stopping there. Over the last year alone, we’ve executed on 130 campaigns and have increased overall revenues by $413,308.71. And it wasn’t just top-line revenue growth… our bottom line was growing even faster, more than tripling over the last year! Here are the top campaigns we ran during the last 12 months. To accomplish all this, the only person we had to hire was an inside salesperson/appointment setter to properly follow up on campaigns. Direct Mail Campaigns. We consistently sent direct mail campaigns to our farm and unconverted leads lists. Our best was the Bad Date campaign to attorneys. We gained three new clients that brought in $79,227.16 in revenue, $6,134 in new MRR, with a total contract value of $242,352. Bad Date Campaign – To Attorneys: ran four different months. We also sent to Property Managers and CPAs. Quarterly Business Reviews. Launched the built-in QBR campaign in Robin’s Infusionsoft CRM program late last year. This was our first formal process for scheduling these, and the automation helped a ton. The results: 29 meetings held with initial project revenue of $96,974.65, and $8,878 in new MRR sales (total contract value of $191,690.65). Website. We updated the SEO of our Robinized website with the help of Robin’s trusted SEO consultant, Joel Brda. We worked with our web provider to change meta tags, search terms and homepage content. Because of these efforts, we closed two projects totaling $12,787.78. Weekly and Monthly Drip Campaigns. To remain “top of mind,” we consistently send drip campaigns to our clients and prospects. Our newsletters are a big hit and contribute significantly to our QBR results. Joint Venture Events. Our JV partnerships are all focused on our top target market, the legal industry. Rhode Island Cyber Security Task Force – new member and presenter: This opportunity happened because Eric met the captain of the Rhode Island State Police at the Providence Business News Cyber Security Summit. Eric presented on Cyber Security and Small Business. Defense Council of Rhode Island – corporate sponsor: Eric partnered with an attorney to deliver a Continuing Legal Education Credit seminar. It has taken us 25 years to get here and just a few years ago, I was unsure what our future looked like. Over the next year, we are well on target to hit the $3 million revenue mark and our future is bright. With the skills we’ve learned and our new business and marketing mindset, I’m certain we’ll top the $7 million mark within five years and be on our way to a self-sustaining business that can run without us!